Event Report: The Ice Dragon is Slain! The A.S. XLIX Festival of the Passing of the Ice Dragon has come and gone. 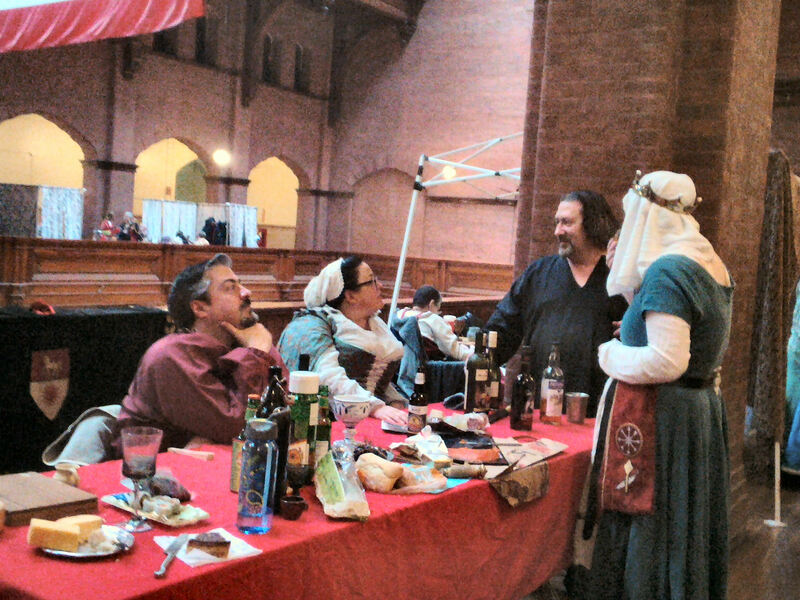 For those who missed it, your ever-vigilant Gazette reporters have the scoop on all that went on at the event, held on March 21 in the Barony of the Rhydderich Hael. The day began with a morning court at which the most notable piece of business was the surprise Their Majesties had in store for Mistress Shishido Tora Gozen: a perfect Laurel ambush. Mistress Shishido Tora Gozen, photo by Lord Simon Peregrine. Mistress Ysabeau Tiercelin, who headed team G, reports: “When their Majesties let the Laurels know that they planned to give Gozen a writ during their reign, I asked if we could do a surprise vigil for her at Ice Dragon. They graciously gave permission and the Secret Laurel for G team sprang into action. Between a secret Facebook group, her household (who took her off the email list just long enough to notify people), and all the Æthelmearc equestrians, it is a testament to honor that no one spilled the beans. 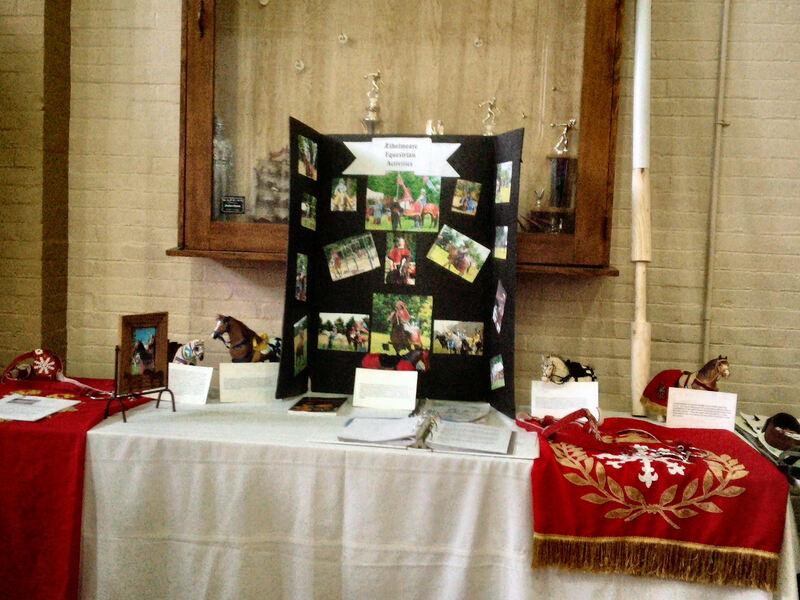 “We set the stage by telling all the equestrians that we had been allotted a special space at Ice Dragon since I had “forgotten” to reserve our normal equestrian salon space, and everyone was encouraged to bring their equestrian works of art to display (thus neatly solving the problem of having her works there for the vigil). Her protégé and equerry made vigil favors of Master Huon’s cookys in linen bags with horse charms, a tooled leather vigil book with Japanese horse was ordered from abroad, and a Pelican/Laurel brooch was commissioned from Crafty Celts. The problem remained of how to get her into morning court without raising suspicion. 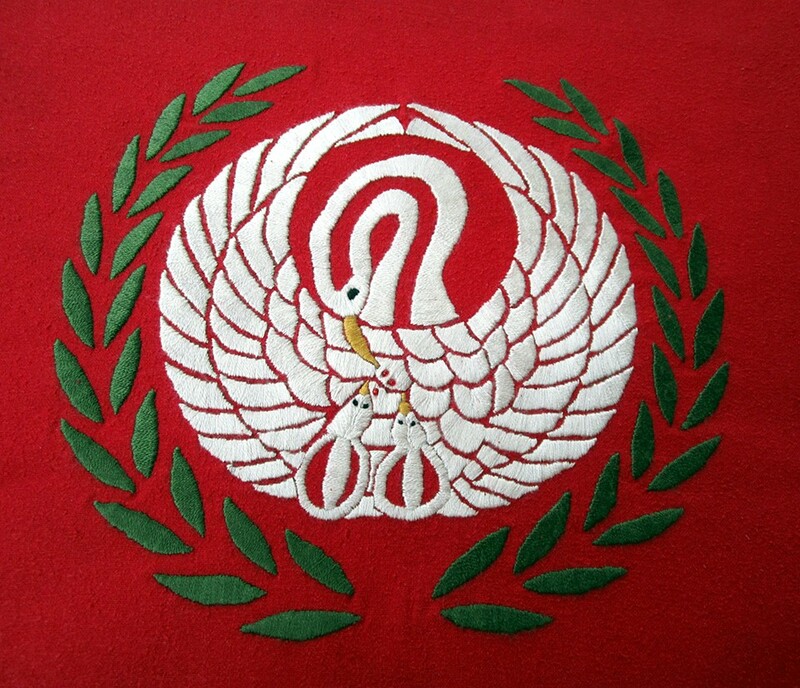 Luckily, I had not been able to finish her Pelican hitatare (Japanese coat) for her last elevation, so that provided the perfect excuse – she was told that it was finally finished and their Majesties had agreed to present it in court. All was ready. “Then came the heart-stopping moment when she emailed after having driven 20-odd hours back from Gulf Wars to let me know that she was tired and might not drive up until the morning of the event. “No problem,” I replied, thinking precisely the opposite, “Just make sure to be there for morning court, since their Majesties wanted to do the hitatare presentation then since it was not quite ‘important enough’ for the main court at night.” Thankfully, arrive she did. “The “Equestrian Encampment” looked beautiful, and being riders with hearty appetites, it never occurred to her to question the plethora of food we had set out. 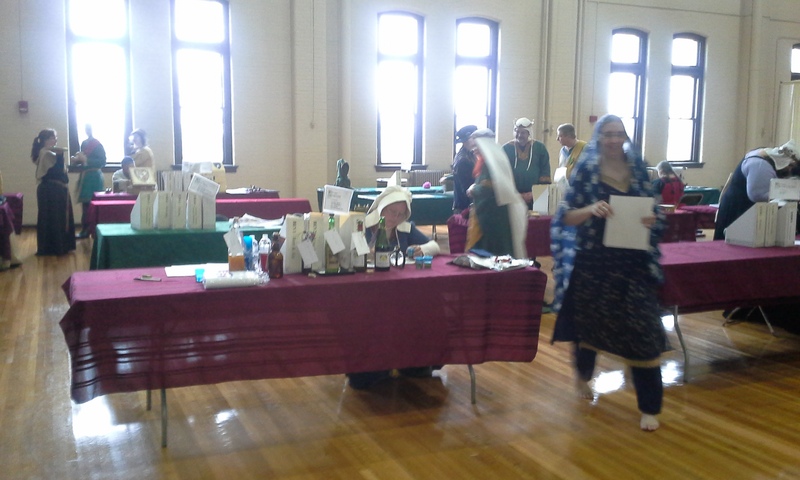 She worked hard to set up the displays, still not suspecting. 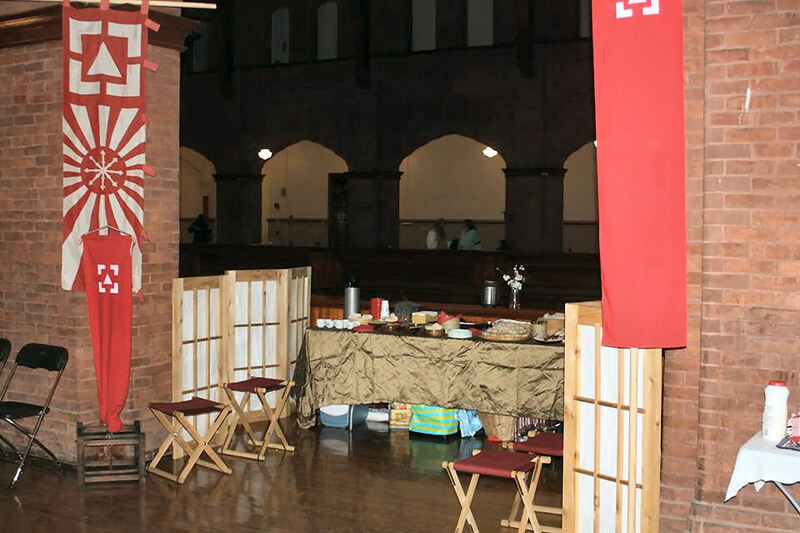 Vigil display for Mistress Gozen, photo by Mistress Arianna of Wynthrope. “We sat together through court, me with the folded hitatare under my arm. We were called up together, and I asked leave to address the populace. 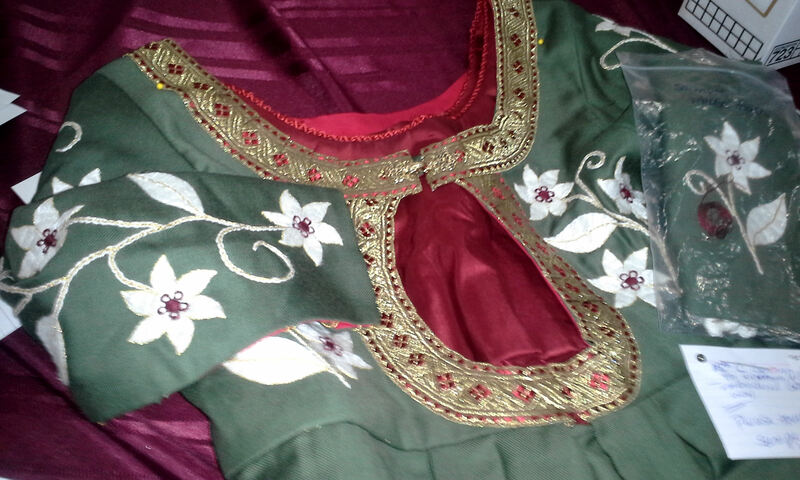 I explained that her “backlog hitatare” was finally finished and held it out to their Majesties, with the embroidery toward them, asking them to do the honor of putting it on. 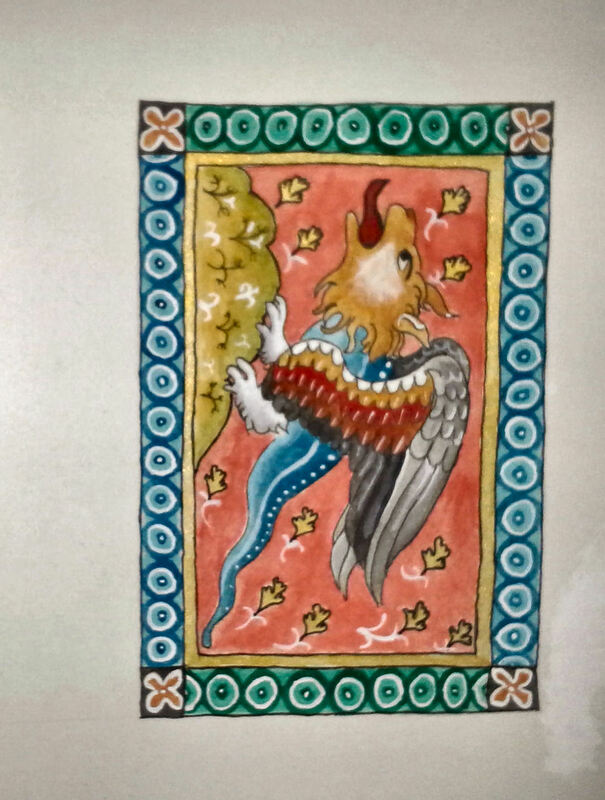 His Majesty played his part to perfection, and circled slowly, revealing to the audience that the pelican was encircled with a laurel wreath. Oohs and cheers began to rise, the Laurels crept stealthily toward the front at a gesture from his Majesty, and Gozen began to look puzzled as this was all going on behind her back. 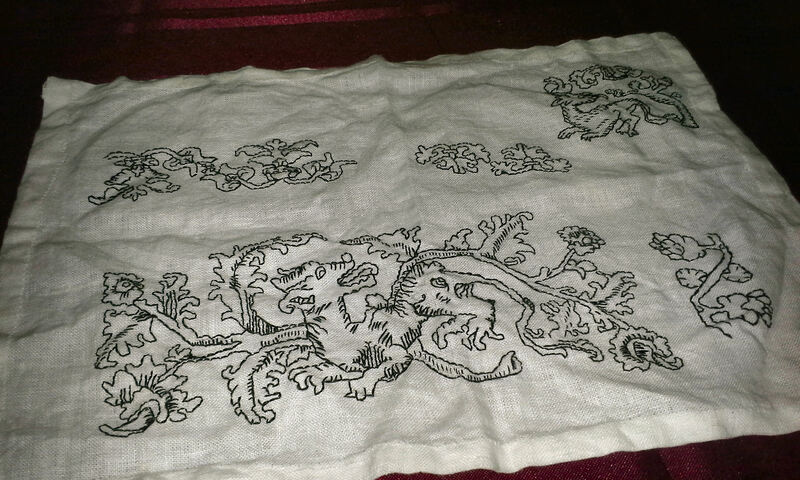 Embroidery on the back of the hitatare created by Mistress Ysabeau Tiercelin. Photo by Mistress Tiercelin. After morning Court, gentles scattered to the many activities that Ice Dragon offers. Photo by Baron Steffan Wolfgang von Ravensburg. 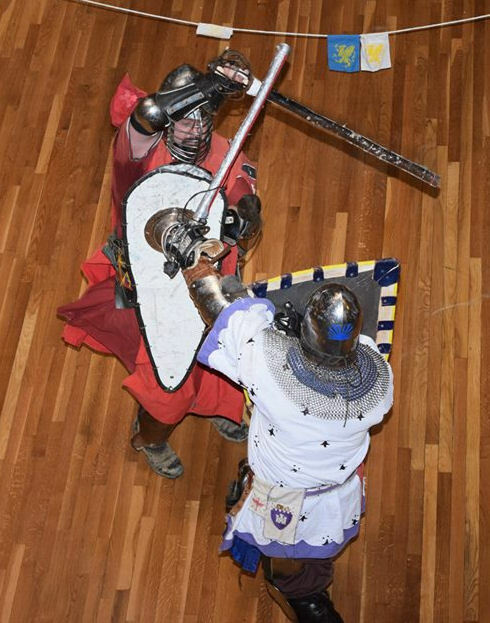 Lord Tegrinus de Rhina vs. Master Tigernach mac Cathail. Photo by Lord Simon. Ice Dragon’s usual rattan bear pit attracted an array of enthusiastic fighters from novices to knights. Lord Horatius as marshal-in-charge was assisted by numerous other marshals overseeing bouts and directing traffic into each of the four lists. Duke Maynard von dem Steine was the victor, but it was noted that he was most gracious about the bouts he lost, making the day for many of the less experienced fighters. 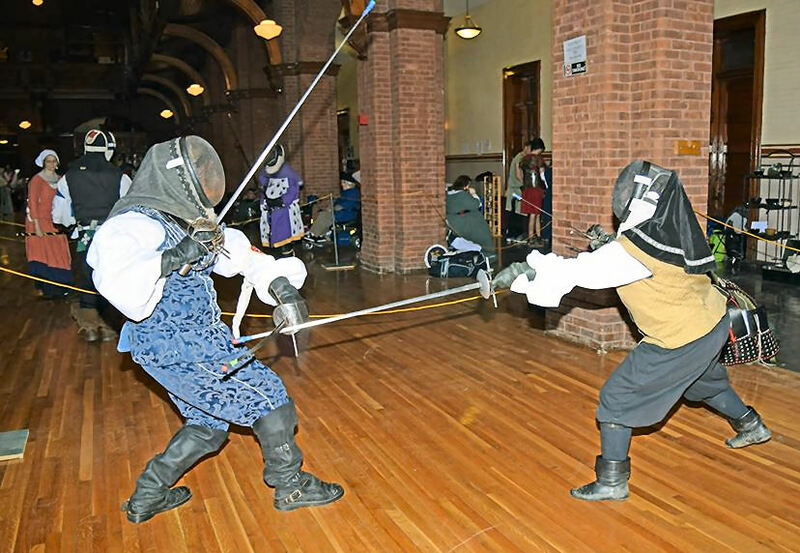 The rapier list featured two tournaments, a single elimination and a reverse bear pit, where the loser stayed on the field after each bout. 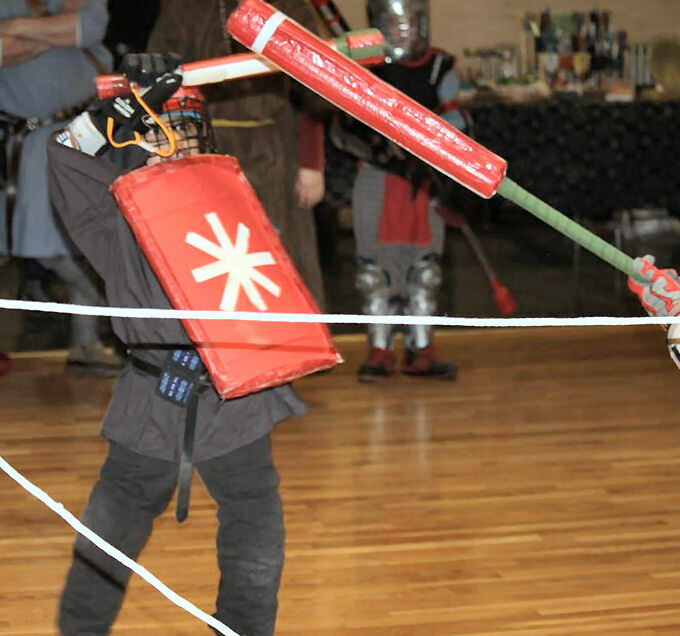 The rapier combat was marshaled by Lord Wolfgang Starcke (who also served as Deputy Autocrat for the overall event), with Lady Aemelia Soteria as MOL. Don Fergus vs. Duchess Dorinda. Photo by Lord Simon. 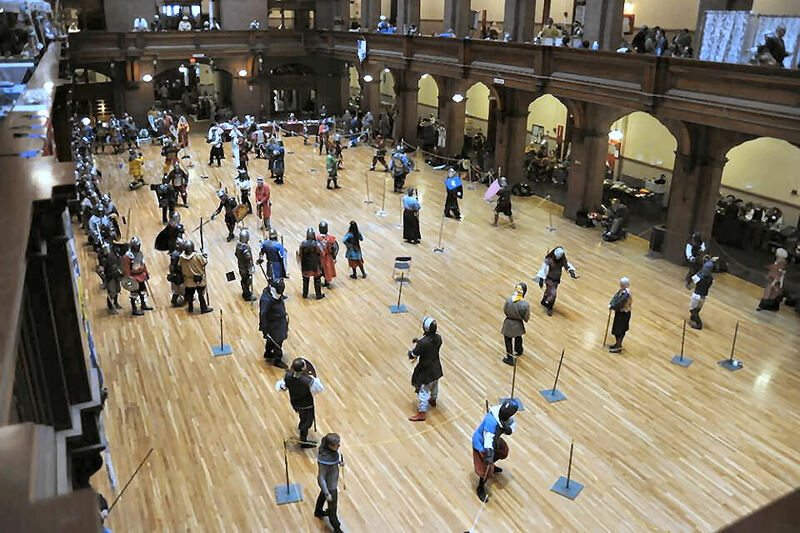 His Excellency Don Benedict Fergus atte Mede defeated Lord Michael Gladwyne to win the single elimination, wounds-retained tournament with forty people participating, and Lord Jacob of Dunmore beat out second-place finisher Lady Fiora d’Artusio to win the reverse bear pit, which had fifty participants. There were about ten White Scarves fencing, including Duchess Dorinda Courtenay, who was the first recipient in Æthelmearc of a Writ for the Order of Defence. According to Don Will Parris, every battle was hard fought. Nicholas fighting in the Youth Tourney. Photo by Duchess Runa Æikibrandskona. THLady Zoe Akropolitina marshaled the youth list with assistance from the Kingdom Youth Marshal, Sir Thorgrim Skullsplitter. Seven youth fighters competed in the tournament, which was won by Olf from Stormsport. THLady Govindi Dera Ghazi Khan organized the Salons, which were held in the upper level balcony areas. They ranged from baronial salons (Delftwood) to households (Yama Kaminari) to the Kingdom History display, to salons for particular activities and guilds (scribes, heralds, and brewers). 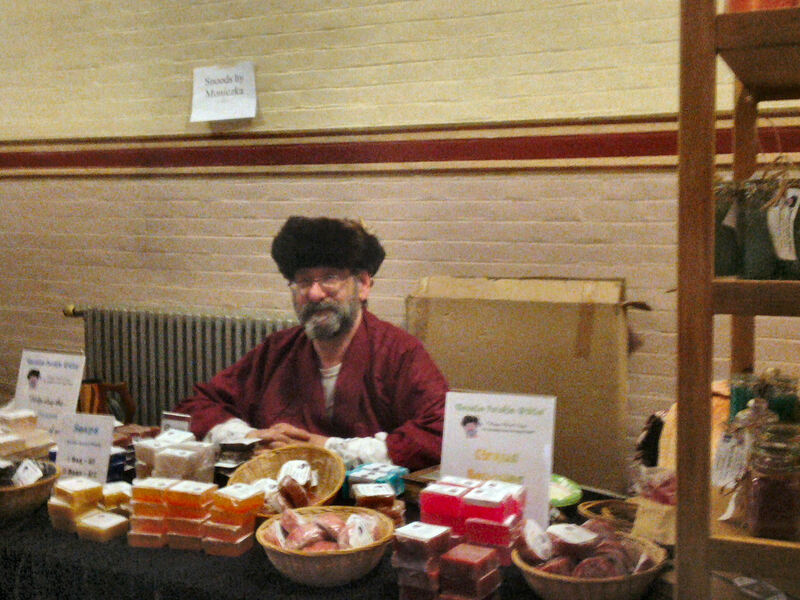 Many of them offered food or arts displays. Display of backlog scrolls. Photo by Arianna. 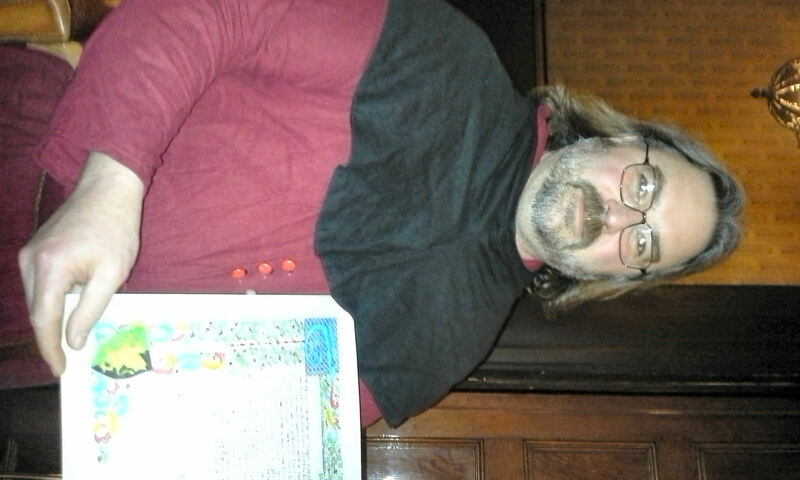 Barony of Delftwood salon. Photo by Arianna. Clan Yama Kaminari’s salon. Photo by Lord Charles the Orange. 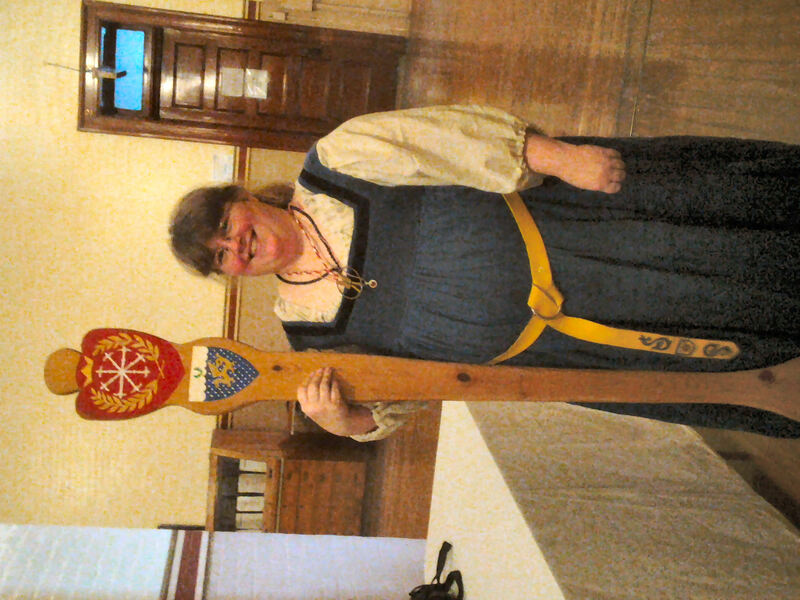 THLady Hrefna Ulfvarinnsdottir, Kingdom Historian, with the Great Spoon of Æthelmearc. Photo by Arianna. Master Daniel del Cavallo mans the brewing salon. Photo by Arianna. 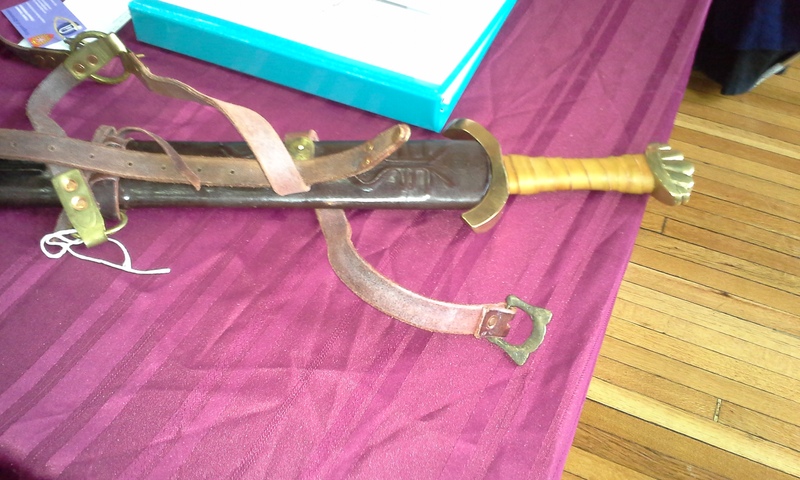 The event featured numerous merchants with such wares as fiber, weapons, fabric, soap, jewelry, garb, and leatherworking supplies. Lady Miriel du Lac served as merchant liaison to keep all of the merchants organized. 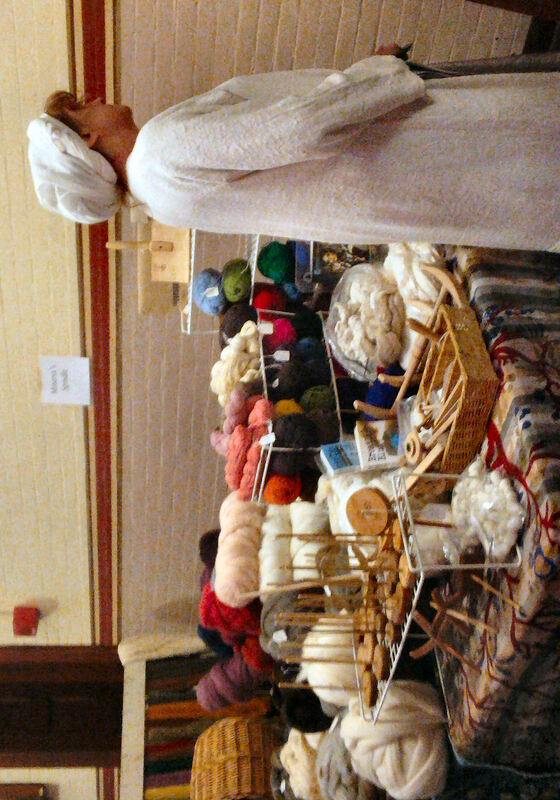 Mistress Gabrielle d’Auvergne’s fiber merchant booth. Photo by Arianna. The tavern was ably run by Lord Bovi Davidson, with entertainment organized by Master Dagonell Collingwood of Emerald Lake. 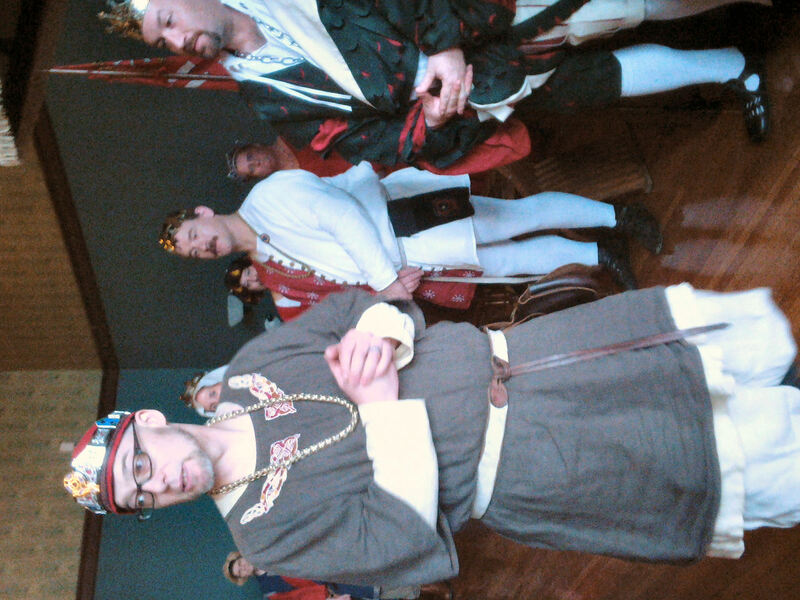 Lord Bovi received the Order of the Keystone at morning court for his service to the Rhydderich Hael. Photo by Mistress Katja Davidova Orlova Khazarina. 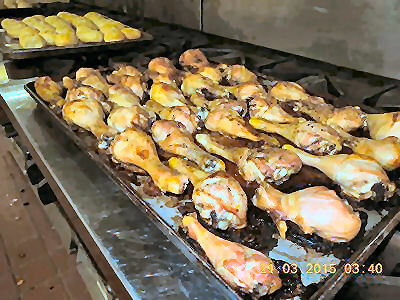 The sideboard offered drumsticks marinated in Goya Mojo sauce, BBQ pork chunks, and roasted root vegetables, plus cheese, pickles, oranges, hard boiled eggs, and rolls. Lord Bovi said he chose simple modern fare since the kitchen would be expected to serve 600 gentles and he had found the period turnovers he did two years ago to be really good but too much work. He focused this year on simple and portable: “Brown, hot, and plenty of it!” he joked with one of his “most amazing crew,” who he credited for the meal’s success. Tiarna Padraig O’Branduibh. Photo by Mistress Hilderun Hugelmann. 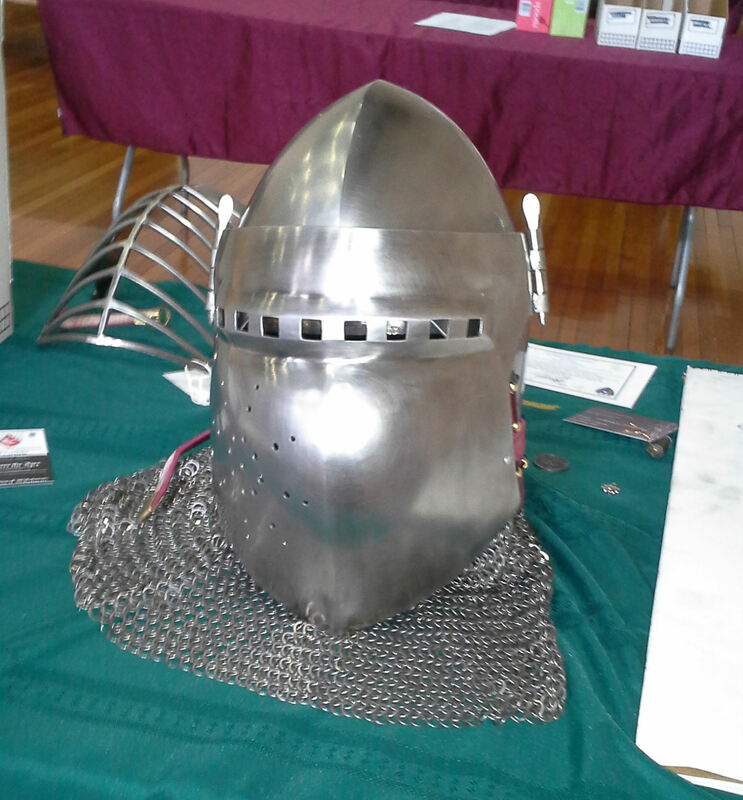 As always, the Arts and Sciences Pentathlon was a big draw with entries in categories like embroidery, brewing, scribal, woodwork, and costuming. 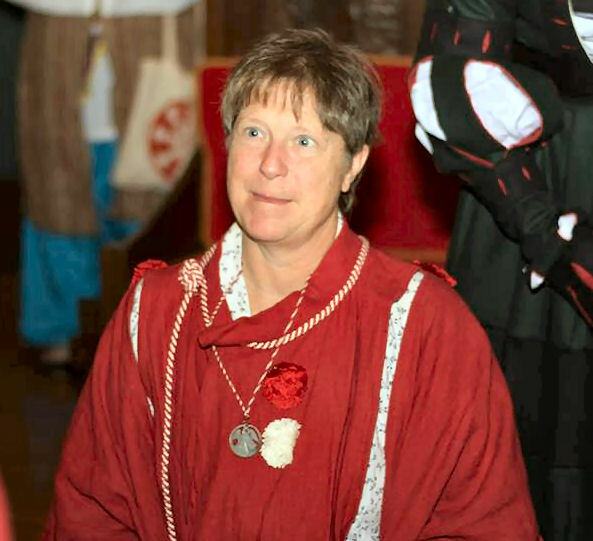 Tiarna Padraig O’Branduibh was the Pent Coordinator, with Baroness Alexanda dei Campagnella organizing the judges, of which there were many. There were entries in individual categories, as well as some groups and individuals who entered the Pentathlon, which required them to compete in at least five different categories. 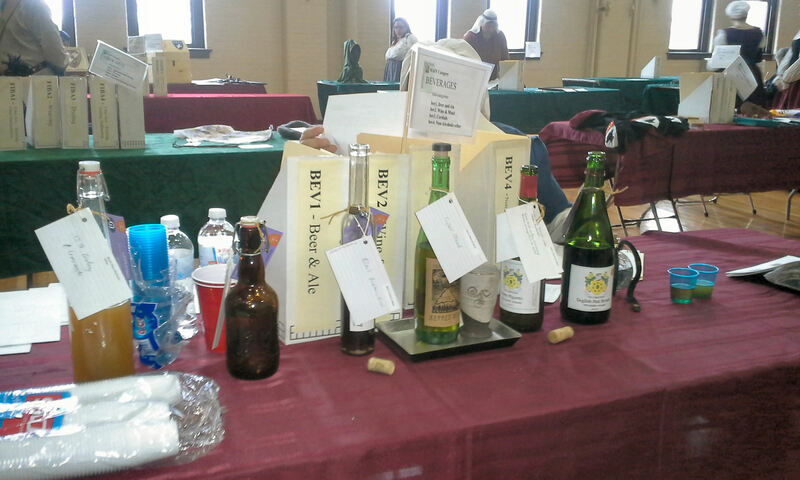 Entries were judged on Documentation, Authenticity, Creativity, Workmanship, Complexity, and Aesthetics. The Pent Room. Photo by Arianna. THLord Madoc Arundel, individual winner of the Ice Dragon Pentathlon. Photo by Arianna. Brewing entries. Photo by Arianna. 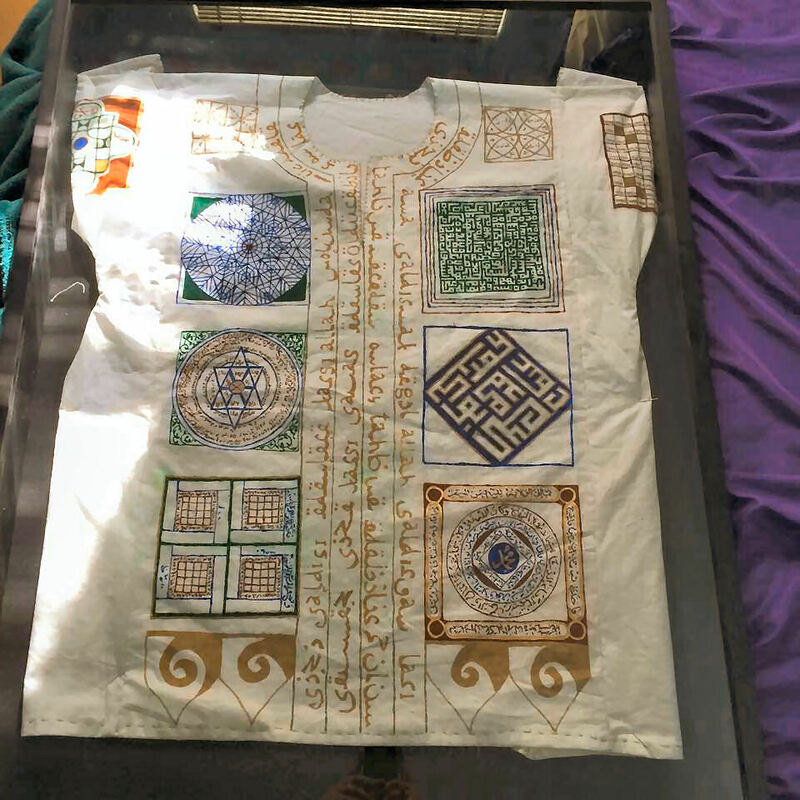 Talismanic Shirt by Lady Sumayya al Ghaziya. Photo by Arianna. 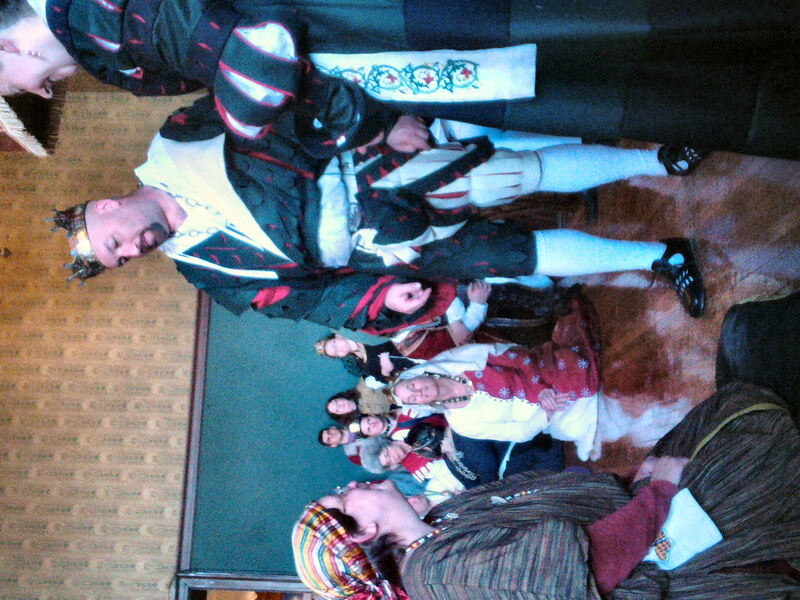 Lady Teresa Alvarez’ German dress. Photo by Arianna. Sword and scabbard by Otto Boese. Photo by Arianna. Bascinet by Lord Enzo de Pazzi. Photo by Arianna. Embroidery by Lady Rowena McCara. Photo by Arianna. Illumination by Baroness Cecily of Whitehaven. Photo by Arianna. Scroll by THLord Kieran MacRae. Photo by Arianna. 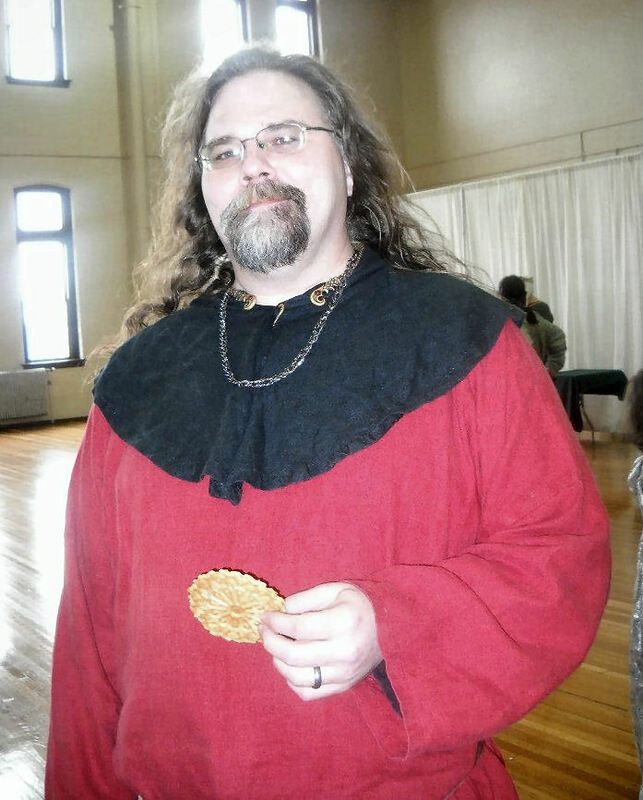 Prince Steinnar of Ealdormere. Photo by Arianna. 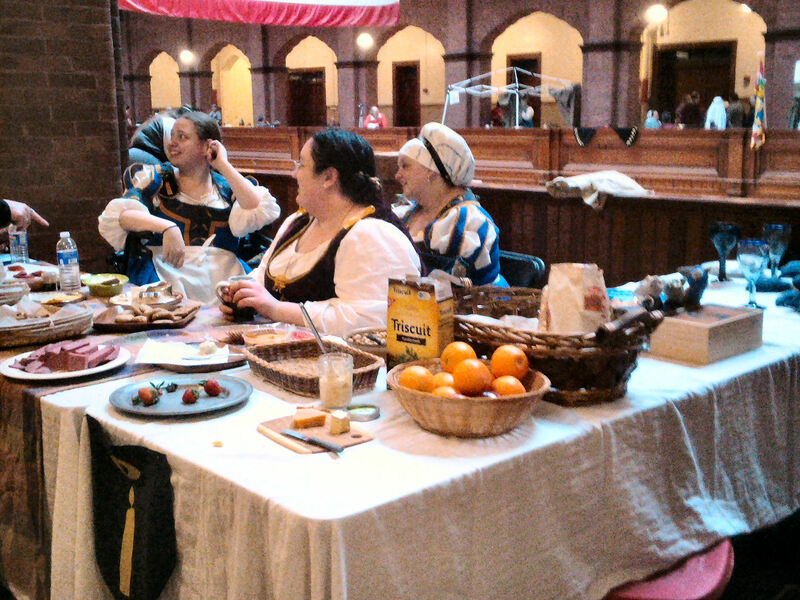 As the day wound down, Royal Court was held in a different room from usual at the front of the second floor. 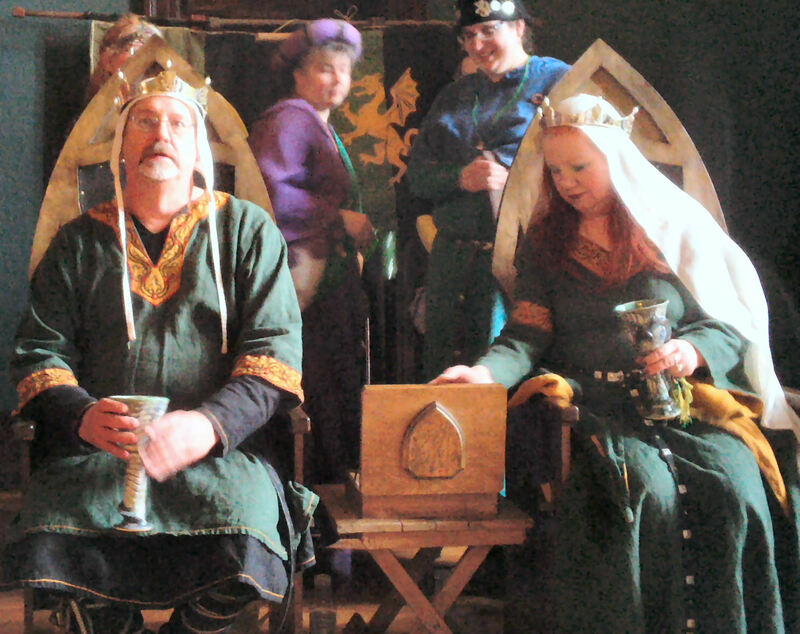 At the start of Royal Court, Their Majesties welcomed Prince Steinnar of Ealdormere. His Highness was pleased to announce that the Lupine Kingdom will ally itself with Æthelmearc at the coming Pennsic War, to the great joy of Their Highnesses Timothy and Gabrielle as well as the populace. THLady Zoe receiving her Pelican Writ. Photo by Arianna. Their Majesties then inducted Mistress Shishido Tora Gozen into the Order of the Laurel for her skill in making equestrian accoutrements. Mistress Gozen’s many virtues were recounted by Master Tigernach mac Cathail for the Pelicans, THLord Rhiannon Elandris for the Order of the Golden Lance, Prince Timothy of Arindale for the Royal Peers, Mistress Ysabeau Tiercelin read a letter from Viscount Alexander Caithnes for the Laurels, and Sir Bear the Wallsbane for the Chivalry. Mistress Gozen, now a double peer, was presented with a brooch from the equestrian community, and finally… she was able to wear her hitatare. 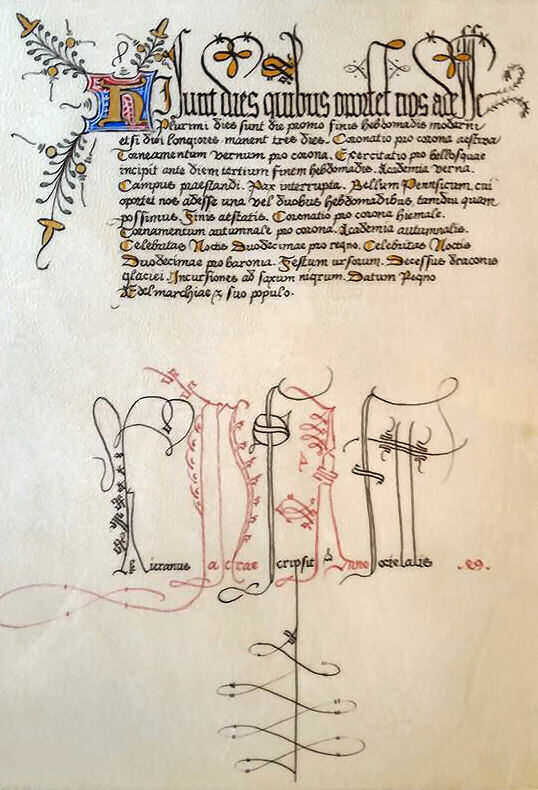 Her scroll, based on the Tale of Genji, was illuminated by Mistress Una de St. Luc and calligraphed by Mistress Daedez of the Moritu. 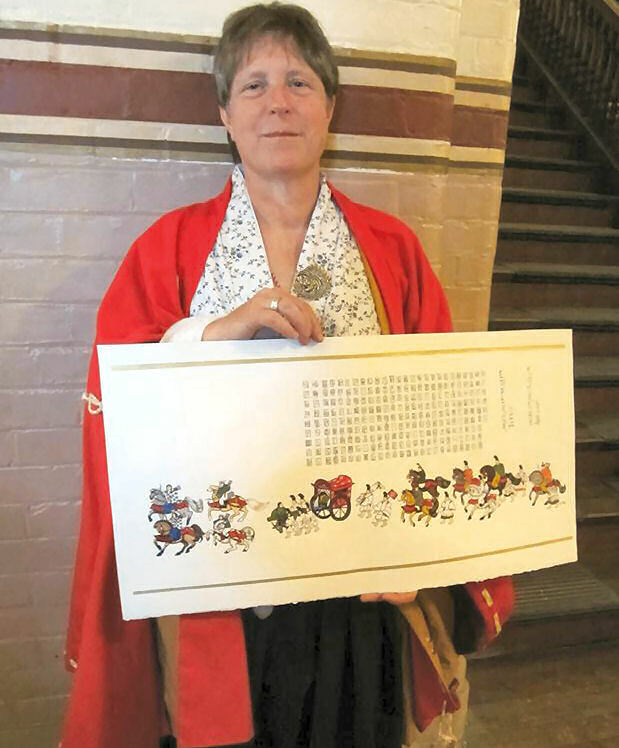 Mistress Gozen with her Laurel scroll. Photo by Mistress Tiercelin. Royal Court culminated in the bestowing of this reign’s Jewel of Æthelmearc on Mistress Cori Ghora, Kingdom Seneschale, as the populace roared their approval of Their Majesties’ choice. 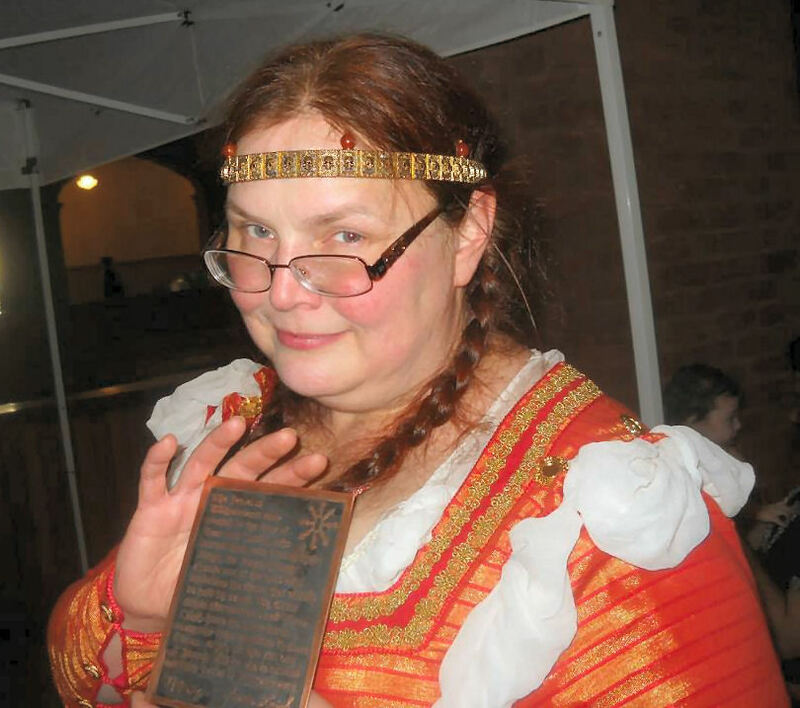 Mistress Cori Ghora, newest Jewel of Æthelmearc, with her copper-etched scroll crafted by Mistress Ekaterina Volkova. Photo by Mistress Hilda. 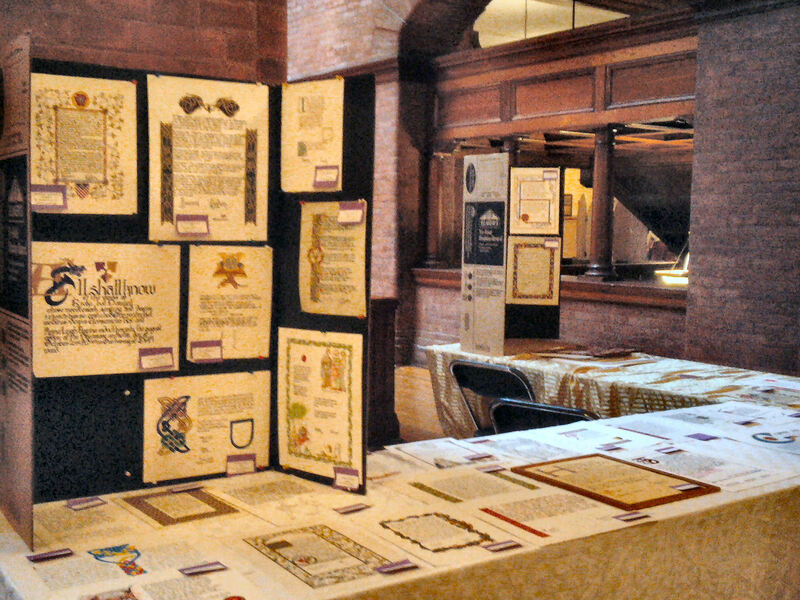 Rhydderich Hael’s Baronial Court followed with several local awards, and culminated in the announcements of the tournament and Pentathlon winners as noted above. Baron Carolus and Baroness Isolda of the Rhydderich Hael. Photo by Arianna. Congratulations to the event autocrat, Lord Magnus de Lyons, and his staff on another successful Passing of the Ice Dragon enjoyed by over 600 gentles. May the Ice Dragon die swiftly and spring arrive with haste! This report was written with contributions from Don Will Parris, Mistress Ysabeau Tiercelin, THLady Zoe Akropolitina, Baroness Katja Davidova Orlova Khazarina, Tiarna Padraig O’Branduibh, and Mistress Arianna of Wynthrope.